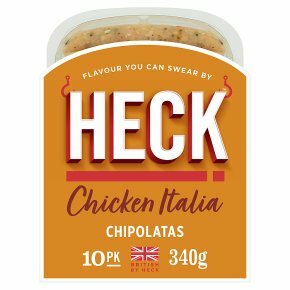 Flavour you can swear. Small batch, big flavour. Low fat. Gluten free.Juicy British chicken with basil, toms & mozzarella, slice up and stir into a creamy risotto. We use lean chicken breast and thigh, both high in protein and niacin, to help maintain a healthy body and an active mind. Grill, fry, sauté, barbecue, bake - there are many ways to cook a sausage. Remove all packaging before cooking.Cooking instructions are a guide only from chilled.For best results, grill: Place under a pre-heated medium grill for 12-14 minutes.Turn occasionally. Ensure piping hot throughout before serving.